The concept of meatless meatballs may sound like an oxymoron, but when done well, they’re delicious – light, crunchy, and zinging with surprising flavor combinations. If you already love meatballs, it’s time to discover meatless varieties. And if you have a limited diet – whether you’re vegetarian, vegan, or gluten-free – there’s nothing more versatile than a meatball. You can swap out ingredients to suit your dietary needs, use a variety of different cooking methods, and serve them on pasta, in soup, as sliders, and in numerous other ways. Read on to learn how to master the delightful meatless meatball. 1. Heat the oil in a large skillet and add the minced onion, diced vegetables, and seasoning. Sauté until the onions are soft and golden. 2. Add the minced garlic and sauté for a couple more minutes. 3. Transfer the cooked ingredients to the food processor. Add the base and liquid flavorings, and pulse just until everything is combined, but not puréed. Most people prefer chunkier meatballs. 4. Add the texture ingredient. Pulse until just combined. 5. Add 1 cup of the dry ingredient. Pulse until just combined. 6. Taste the batter; add salt as needed, probably 1/2 to 1 teaspoon, depending on the saltiness of the other ingredients. Pulse until just combined. 7. Lightly coat your hands in oil to keep the batter from sticking. Try to form a meatball. The consistency will vary slightly depending on the ingredients, and some adjustment may be necessary. 9. Form the meatballs. The size comes down to preference. Consider how you will serve them. For soups or curries, bite-size balls are usually best. 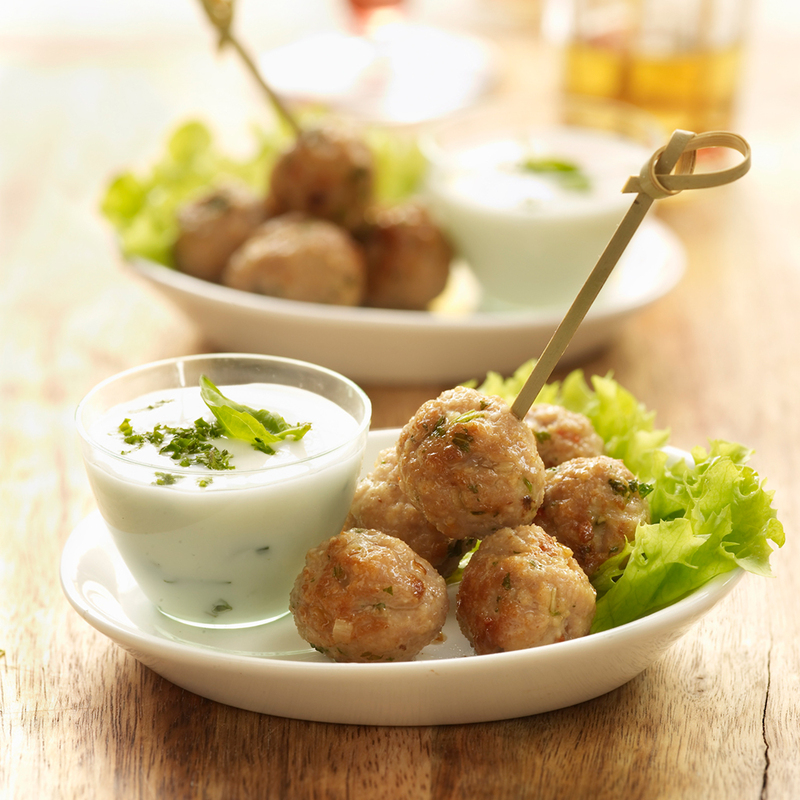 For spaghetti and appetizer skewers, larger golf ball-size balls are often preferred. It’s easy to replace ingredients to suit different needs. 1. Cut the bread into crouton-sized pieces. 2. Arrange the bread pieces on an ungreased baking sheet in a single layer, leaving room between them. 3. Bake at 250º for 10 to 15 minutes, turning them over halfway through. 4. Remove from the oven and let cool. Once the meatballs are done, it’s time to turn them into a meal. Try these creative serving ideas. Sliders: Serve on small buns and top with lettuce, shredded cabbage, and/or tomato slices. Dress with a favorite sauce, mayonnaise, mustard, or ketchup. Po’ Boy: Serve on a hoagie roll or French baguette, cut in half, and top with coleslaw or lettuce, shredded cabbage, pickles, and tomato slices. Dress with remoulade sauce or another favorite sauce. Soup: Add to Italian wedding soup, Albóndigas (Mexican meatball) soup, or any other meatball soup. Pasta: Serve on spaghetti or another favorite Italian pasta and top with marinara or pesto sauce. Garnish with Parmesan cheese. Appetizer: Serve on skewers and provide a complementary dipping sauce. Wraps: Wrap in a tortilla and top with shredded lettuce, chopped cucumber, tomato, red peppers, and/or cilantro. Dress with a complementary sauce. Pockets: Stuff inside pitas and top with diced cucumbers, tomatoes, and onions. Add feta cheese or a spoonful of hummus, and drizzle on a favorite sauce, such as tzatziki or tahini. Curry: Braise in red, green, yellow, or Massaman curry with carrots, potatoes, and bell peppers. Serve over rice or noodles and top with cilantro, shredded basil, and/or chopped peanuts. Move over meat: Meatless meatballs are here, and they’re versatile, healthy, eco-friendly, and bursting with flavor. With countless ingredient options, various cooking methods, and endless serving options, they can be made to suit any palate or occasion. Even meat lovers may soon long for meatless Monday.